My neighbor, Anna Mary (Bonifield) Metz has in her possession a photo of James and Frank James. 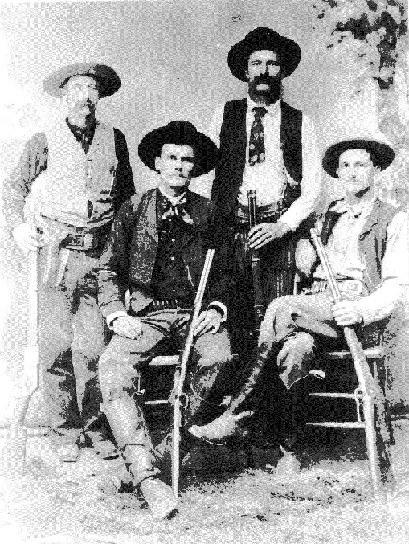 This photo was sent to Mary's mother, Laura (King) Bonifield, by Jesse James III. The story that Mary tells is that Laura was related to Jesse and Frank. They came to visit her in Woodward on many occassions. Mary also has a clipping from a newspaper showing a photo of a person claiming to be Jesse James. All information found on these pages is under copyright of Donna Dreyer. This is to protect any and all information donated. The original submitter of the information will retain copyright as well. Unless otherwise stated, any donated material is given to Donna Dreyer to make it available on any of the Ellis, Woodward, Harper, Dewey Counties, or any related Oklahoma pages maintained by Donna Dreyer. This material will always be available online at no cost, it will always remain free to the researcher.